“X” Marks The Spot is a series that zooms in on a specific section of the giant treasure map that is the Scarecrow Video floor plan – spotlighting some of the gems (known and unknown) hidden within Scarecrow’s vast collection. Join the hunt. STEAM: THE TURKISH BATH (1997 – Italian title: Hamam – Il Bagno Turco) This haunting film was Turkish-born Ferzan Ozpetek’s directorial debut and was way ahead of its time in its telling of several unconventional love stories. Francesco and Marta (Alessandro Gassman & Francesca D’Aloja) are a high-powered Rome couple who are bickering and stressed out because of the business they run together. So it comes as a bit of a relief when Francesco has to leave Italy for Turkey to settle the affairs of his recently-deceased aunt who was an expat in Istanbul, where she owned a hamam (Turkish bath). However, once he arrives in Istanbul, Francesco finds himself intrigued by and attracted to Mehmet (Mehmet Gunsur), the son of the Turkish couple who sort of adopted his aunt. Soon, Francesco finds himself succumbing to the laid-back pace of Istanbul – and to Mehmet. Marta eventually arrives and the plot thickens in directions both expected and unexpected. A nice European companion piece to Brokeback Mountain – but somehow a much more rewarding experience. Terrific score by the New Age group, Transcendental. I’M NOT SCARED (2003 – Italian title: Io Non Ho Paura) This quietly sinister thriller unfolds, ironically, against the backdrop of a sun-drenched Sicilian summer in 1978. Michele (Giuseppe Cristiano) is like any other rural 9-year old, enjoying the endless golden fields and blinding days with his friends. Then he stumbles across a boy his age named Filippo (Mattia Di Perro) chained in a dark hole near an abandoned farmhouse. Over a series of visits, Michele forges a kind of secret friendship with the deeply traumatized Filippo – even as he wonders how Filippo ended up in the hole. Unfortunately, Michele slowly realizes the people responsible for Filippo’s situation may be much closer to home than he thinks. He soon finds himself in a position where he must choose between family loyalty – and doing the right thing. Director Gabriele Salvatores allows the slow burn story to unfold in hypnotic fashion. Under his camera’s gaze, the Southern Italian countryside glows with a deceptively benign light – effectively disguising the darkness at the heart of this gripping tale of innocence lost, but character forged. MID-AUGUST LUNCH (2008 – Italian title: Pranzo di Ferragosto) Come every August, Italian cities turn into ghost towns as the locals head off for their annual holidays elsewhere. This comedy continues the theme of family as put-upon Gianni (Gianni Di Gregorio) finds himself caring for the elderly mothers of his condo president and his doctor in an effort to repay favors. Complicating matters is the fact that Gianni is already caring for his own mom (Valeria De Fransciscus) and her close friend. Looks like Gianni will be trapped with the four matrons in his sweltering flat all month. 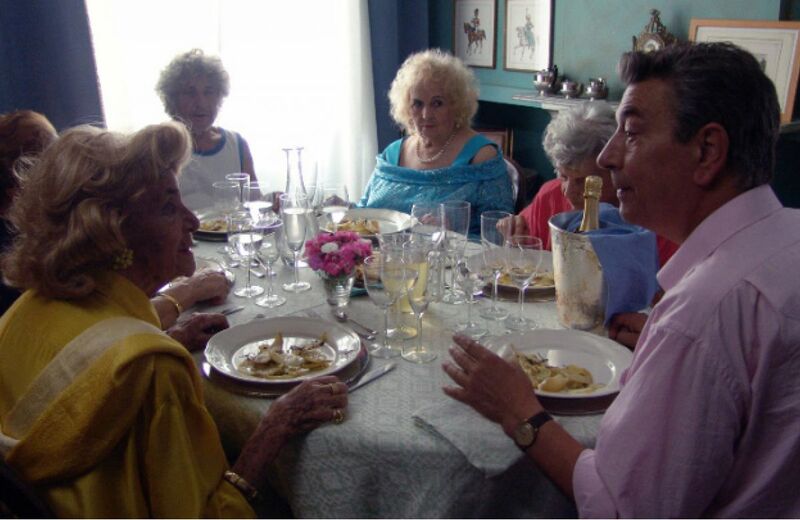 However, what starts out as Gianni being stuck watching over the Italian Golden Girls while everyone else is on Vay-Cay for the summer turns into a warm account of community, bonding, and food. Di Gregorio also directed this flick which won the Luigi De Laurentiis Award for First Feature Film at the 2008 Venice Film Festival. Mid-August Lunch runs a scant 75 minutes but proof of its subtle effectiveness is how you wish it would run longer to allow us to spend more time with Gianni and his four colorful ladies. I AM LOVE (2009 – Italian title: Io Sono L’Amore) Luca Guadagnino is the most promising Italian director of his generation and I wouldn’t be surprised if he ends up with his own spot in Scarecrow’s Director Section someday, next to the greats mentioned above. His films are usually about awakenings – spiritual, psychological, emotional, sexual. They include the 2017 modern classic Call Me By Your Name and his wonderful but vastly underrated 2018 remake of fellow Italian auteur Dario Argento’s Suspiria. This moving 2009 romantic drama preceded those two excellent films. Revolving around Emma Recchi (the eternally sleek and statuesque Tilda Swinton), the Russian-born trophy wife of an Italian industrial magnate, I Am Love chronicles her unexpected affair with her oldest son’s close friend, Antonio (Edoardo Gabriellini). This leads to repercussions – both tragic and liberating – for Emma, her younger lover, and the family. Guadagnino uses artful suggestion rather than overt theatrics to tell this love story – and it’s all the more powerful for it. LOOSE CANNONS (2010 – Italian title: Mine Vaganti) Family dynamics of a much more ribald type are at the heart of this delightful screwball comedy. The Cantone clan runs a pasta empire in the South of Italy and patriarch Vincenzo (Ennio Fantaschini) is getting ready to turn it all over to oldest son Antonio (Alessandro Preziosi). Except Antonio comes out as gay at a memorably loony dinner party – leading to the result Antonio expected and wanted: the homophobic Vincenzo throws him out of the family. Free to do what he wants, Antonio merrily skips town – leaving the family business to younger son Tommaso (Riccardo Scamarcio). What’s the problem with that? Well, Tommaso is also gay and was planning to come out at the dinner party to get banished – before that jerk Antonio hijacked his plan and screwed him. Tommaso now doesn’t dare come out, too, lest he kill off his dad with another heart attack. Nope, Tommaso has to (temporarily) play the role of dutiful heterosexual heir to the business. Ferzan Ozpetek’s film starts out a colorfully irreverent situation comedy, but deepens into a touching, complex tapestry about family loyalty, platonic versus romantic love, and the importance of doing you. Perfect for an American remake. John S. is a Scarecrow volunteer who loves James Bond, Jason Bourne, Italian Gialli, Argento, Hitchcock, Ridley Scott, Sandra Bullock in The Proposal, Julia Roberts in Pretty Woman, Theo James in anything, Steve Zahn in everything, Halloween (movie & holiday), South Park (cartoon & neighborhood), and Scarecrow Video – not necessarily in that order.